Update (Oct. 30, 2013) – There are some news reports going out saying some units of the Dell Latitude 6430U are emitting a strong odour of cat urine. Mercifully, I was spared one of these units and I’m happy to report my review unit smelled just fine. Dell technicians have since responded saying the odour has to do with the manufacturing process and isn’t harmful to users’ health, and that they’ve since fixed the problem. If your model of the Latitude 6430U has this problem, Dell recommends sending off for a replacement. Hi there, my name is Candice So and today on All Hands On Tech, I’m reviewing the Dell Latitude 6430U, an ultrabook geared towards the SMB market. 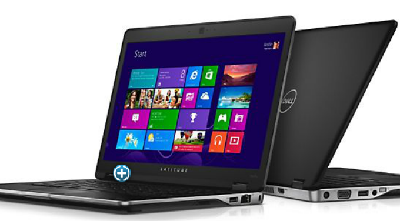 In terms of its dimensions, the Dell Latitude comes with a 14 inch display. It measures 20.9 mm thick and weighs in around 3.7 pounds when it runs on a three-cell battery. It also comes with an Intel Core i7 processor, Intel graphics, and can come with solid state drives. The Latitude 6430u also has a nice smooth sheen to its keyboard, making it feel comfy to type on when you’re working for longer periods. And while it’s not the lightest ultrabook of its class, Dell has made a few changes here and there to try to cut back on its weight. For example, instead of having a disc drive, it has a portable e-media bay that plugs into the ultrabook and reads CDs and DVDs – helpful for an SMB employee on the go. (Image: Dell). The Dell Latitude 6430U. Considering what it’s got inside, the Dell Latitude 6430u delivers a pretty good performance. The ultrabook allowed me to do some easy content creation and basic editing without any hitches, and without slowing down its performance. However, when I received my particular review unit, I was a little disappointed to see it was running Windows 8. The Dell Latitude is not equipped with a touch screen, so when it comes to switching screens or switching between apps, it wasn’t as intuitive as I wanted it to be. It took me some time to get used to Windows 8. I do feel an ultrabook without a touch screen would probably have worked better if it was running Windows 7, especially in an SMB environment. In terms of its battery life, I found the Dell Latitude 6430u also was a little lacking compared to other ultrabooks. When I streamed an HD movie in full screen mode on constant loop, it lasted about 6 hours, 10 minutes, before I needed to run for the power cord. Still, that’s not the greatest compared to other ultrabooks on the market. Another caveat with the ultrabook is that it’s expensive. The suggested retail price starts at around $1,300 – not the cheapest option out there, but definitely a sturdy one. Still, if you’re looking for a good-quality ultrabook that can run for most of the work day and help you be productive, this is a good choice.